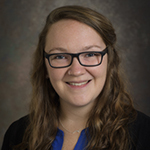 Kendra Lynn has joined the Mantle Processes Group as a postdoctoral scientist. Kendra received her PhD in Geology and Geophysics from the University of Hawai‘i. She worked with Mike Garcia on compositional zoning in olivine from Kīlauea tephras, focusing on diffusion chronometry as a tool for investigating magmatic processes. At the University of Delaware, Kendra will be applying her background in trace elements and diffusion modeling to the analysis of peridotites.